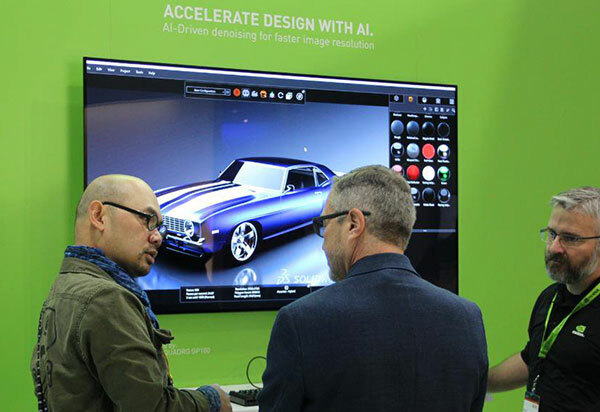 DE’s Senior Editor Kenneth Wong (left) learns about SolidWorks Visualize and how it uses NVIDIA’s AI denoising technology. Image courtesy of NVIDIA. For game players, real-time visualization has always been the default, the standard expectation. Would you play Tomb Raider if you have to wait a few minutes to rerender the scene every time Lara Croft changes direction in her pursuit of an ancient artifact? Can you imagine playing Assassin’s Creed if your avatar’s jumps, punches and slashes take a few minutes to animate? Given a choice between graphics quality and speed, gamers would grudgingly opt for speed. This is the reason early PC games generally ran in low-polygon graphics, to enable real-time response within the constraints of the limited compute power in the gaming hardware of the era. But the GPUs changed games and are similarly changing design and engineering. With every generation, GPUs push what’s possible in real-time visuals. In the current RTX-powered NVIDIA GPUs, games achieve physically accurate raytracing in real time. At the latest GPU Technology Conference (GTC, March 18-21, 2019, San Jose, California), NVIDIA CEO Jensen Huang’s demo of Dragonhound, a role-playing game powered by the Unreal Engine, made gamers itching for a ride on the flying beasts. A parallel development is also happening in engineering and design. Previously, some engineers and designers were willing to put up with the time required to create physically accurate renderings in return for stunning visualizations. For this group, visuals are digital prototypes for critical decisions, not just for entertainment. So accuracy—from the way light reflects on the surfaces to the way the texture of the chosen materials look—was more important than immediate gratification. Other engineers and designers were not willing to add rendering to their workflow to inform their design decisions because the process was too slow, so they would settle for subpar visualizations. But with the latest GPU-equipped workstations, such as the Precision family of workstations from Dell, both accurate visuals and real-time rendering are possible, without sacrificing one to achieve the other. Whereas RTX and its real-time raytracing benefits come to gamers via the entertainment-focused NVIDIA GeForce GPUs, it comes to the professional market as part of the NVIDIA Quadro RTX GPUs. Software developers supporting RTX include both entertainment powerhouses like Pixar, Unreal and Weta Digital, and design software leaders like Autodesk, Dassault Systèmes and Siemens PLM Software, according to NVIDIA. Hardware developers like Dell have released workstations equipped with NVIDIA Quadro RTX GPUs. In February, at SolidWorks World 2019, NVIDIA and its partners demonstrated how SOLIDWORKS Visualize, the rendering application in the SOLIDWORKS CAD software, makes use of RTX’s real-time raytracing capacity. 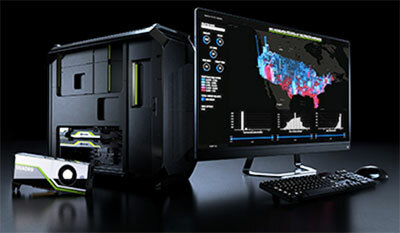 Rack and tower workstations with Quadro RTX GPUs are offered by NVIDIA partner Dell in its Dell Precision product line. If the GPU-accelerated workstations have freed the designers and simulation software users from the data center, can the graphics accelerator do the same for those working with compute-intensive AI and machine learning workloads? The answer, according to NVIDIA CEO Jensen Huang, is yes. At the latest GPU Technology Conference (GTC), Huang announced the launch of the GPU-accelerated Data Science Workstation (DSW). NVIDIA has already delivered the reference architecture for the machine. The design accommodates up to 96GB of ultra-fast local memory so data scientists can load large datasets and perform compute-intensive workloads locally. The RTX’s raytracing power in this case will play a role in data visualization to offer better insights, to reveal patterns and trends that might be difficult to spot in numerical rows and columns. NVIDIA’s partner workstation makers like Dell are expected to deliver these DSWs in their own brand-specific flavors and configurations. The technology is partly responsible for the speedup in GPU-accelerated visualization programs such as SOLIDWORKS Visualize. Rendering software providers like Chaos Group keep a close watch on NVIDIA’s hardware. For these developers, the GPU offers new features and enhancements they can implement in the subsequent upgrades. 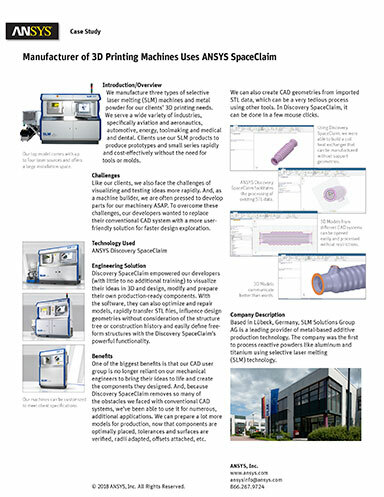 Many of them offer CAD-plugins that let CAD users work directly from the design environment to produce photorealistic product shots and scenes. “We expect that in the coming years the RTX series of GPUs will have a large impact on rendering and will firmly establish GPU ray tracing as a technique for producing computer generated images both for off-line and real-time rendering,” remarked Vladimir Koylazov, CTO and founder of Chaos Group. In the past, real-time raytracing put a heavy burden on the local machine, often putting it into an inactive mode. 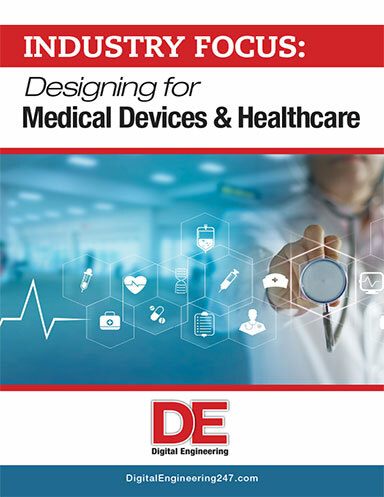 Therefore, design engineers tended to use it sparingly, turning such features on only when they feel an accurate view of the product is urgently needed. But the availability of hardware with RTX technology could change that attitude. If real-time raytracing can be achieved with no computing penalty, more engineers will likely use it liberally to get a better understanding of their products’ aesthetics and functions. Perhaps in the future, they will come to expect real-time rendering as the default state in their workflow, just as gamers do in their gameplay.